Like many of Washington’s waterways, Icicle Creek in Chelan County is the site of several projects with the goal of helping salmon and other fish make their way upstream to spawn. Many of the projects involve constructing structures, like a habitat-friendly culvert or a fish ladder, to balance fish passage with the many other needs and uses for the river. But a project sponsored by Trout Unlimited is focused on removing barriers—in this case, large boulders in the creek that stand in the fish’s way. Once the boulders are removed, fish will have access to another 26 miles of habitat. This project is one of a suite of projects the recently released Icicle Programmatic Environmental Impact Statement (PEIS) recommends in the Preferred Alternative to implement the Icicle Strategy, an $82 million dollar effort to ensure a sustainable water supply and water resources for people, farms, and fish in the Wenatchee Basin through 2050. Aspect has been the technical and facilitation lead on this project since 2012. Our work includes serving the Icicle Work Group—a group of approximately 30 stakeholders from local, state, and federal governments, Tribes, irrigation districts, farmers, and non-profit groups that created the Icicle Strategy; developing the PEIS; and leading technical evaluation of proposed projects across the basin that may improve water resource management and increase instream flow during critical flow periods. Senior Geotechnical Engineer Nick Szot, PE, and Senior Engineering Geologist Mark Swank, LEG, are supporting Trout Unlimited’s goals for the Icicle Creek project by developing alternatives for fish passage and relocation of a 16-inch-diameter watermain that brings water to the City of Leavenworth. They have also provided considerations for protecting creek bank slope stability during construction, which is expected to start in summer 2020. Learn more about the project in this recent article in the Wenatchee World. 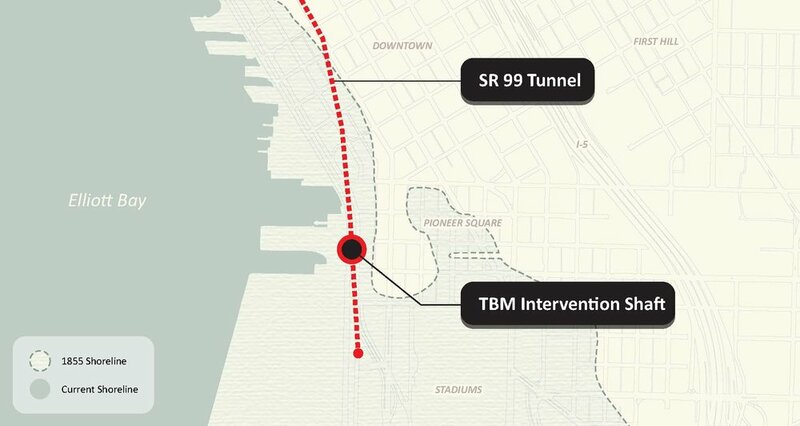 As Seattle weathers the close of one historic stretch of Highway 99 and awaits the opening of a brand new one (at the time, the largest soft-ground tunnel bore in the world), we’re recapping a tale that played out in connection to one of the more dramatic milestones of the tunneling project: Bertha gets stuck. In December 2013, the mega tunnel boring machine known as Bertha overheated and broke down 1,000 feet into its journey. Eager to keep the project moving, crews working for Washington State Department of Transportation (WSDOT) quickly designed and excavated a deep rescue shaft to get in front of the stuck machine and repair it. It was a complicated effort to drill down to Bertha considering the unique geology and human history that has defined Seattle’s waterfront. Stabilizing the ground to create the 130-foot-deep shaft required a significant amount of dewatering  that had to be done quickly. This dewatering caused the surrounding soils to settle much more than was anticipated from the planned tunnel construction—the settlement reached over a wide half-mile radius, and about an inch in some places, and even more than that close to the shaft. An inch may not seem like a lot, but for the underground maze of City of Seattle (City) utility infrastructure, including aging, brittle water and sewer lines (some over 100 years old), any additional settlement was problematic. This unforeseen settlement was enough to trigger an expedited program to assess and replace the utilities where risks were unacceptably high. The City, in need of expertise on local geology, hydrogeology, tunneling, and soil behavior, brought on Aspect to investigate problems resulting from the rescue shaft construction and help design repairs. 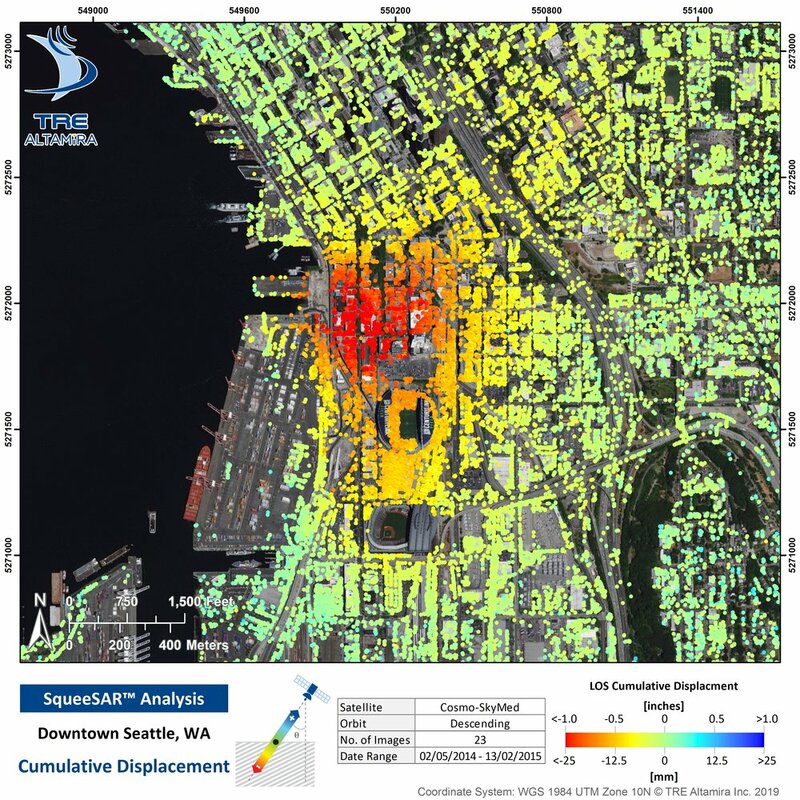 The aerial image of the Seattle waterfront shows locations of satellite radar altimetry points TRE Altamira used to measure precise changes in ground surface elevation from May 2014 through February 2015, which included the period of Bertha rescue shaft dewatering. The colors of the dots represent the cumulative change in elevation, with hot colors showing subsidence and cool showing uplift. The orange and red areas show the broad pattern of ground subsidence associated with the shaft dewatering. For more information on this technology, visit TRE Altamira. Aspect’s role was four-fold: determine what parts of the City’s infrastructure were being most affected by the settlement; assess vulnerability of other areas further along the tunnel route; assist with geotechnical engineering recommendations for replacing infrastructure damaged by the settlement; and help the City understand the cause of the settlement. Our investigation started with an extensive review of the waterfront’s underlying geology. Deep beneath the City lies a complex history of multiple glacial advances and retreats, separated by long interglacial periods. Sediments from glaciations include tills, layers of glacial lake and marine silts and clays, and sheets of glacial outwash sand and gravel. These glacial soils are interbedded with floodplain silts and sands and gravelly channel deposits transported by rivers flowing from the surrounding mountains, including lahar deposits (large volcanic mudflows) from as far away as Mount Rainier. These strata were deposited in more-or-less horizontal and generally orderly ways, then subsequently compressed and compacted by repeated advance of glacial ice sheets. In the Pioneer Square area, a present-day look at the resulting stratigraphy is, however, far from orderly, due to its setting within the Seattle fault zone. This zone of tectonic compression repeatedly ruptured during prehistoric earthquakes, and much of the strata are now sheared, tilted, overthrust, and truncated. All of this was then overlain by weak estuary, beach, and tide flat deposits—and then extensively modified by humans. A major part of Aspect’s analysis focused on the location, thickness, and nature of the weak and shallow soils draped above the strong glacial soils, intertwined with the historical changes that occurred as Seattle developed its waterfront. The Pioneer Square area was a small upland Native Americans had lived on for millennia. Occidental Square was a shallow coastal lagoon, and most of the area south of King Street was tide flats. As timber and shipping industries flourished in the 1800s, much of the waterfront was developed with piers and trestle bridges, then filled with sawdust and wood waste from waterfront mills and soft muck sluiced from nearby hills. On top of all that, roads, sewer lines, water lines, and buildings were constructed on the new ground. Not surprisingly, these weak fills have settled over time, resulting in bumpy roads, tilted sidewalks, and tall curbs in the Pioneer Square neighborhood. But these same soils were also highly susceptible to further consolidation when the water table was rapidly lowered by the Bertha rescue shaft dewatering. To assess the areas of vulnerable underground utilities, we dug into the historical records—maps dating from the original land surveys of Seattle to locate the original shorelines, and previous drilling investigations going back decades to reveal the subsurface data. Aspect compiled soil records of hundreds of borings and wells to develop a database that could be mapped in three dimensions and used to identify the areas where weak soils were present. When combined with the City’s utility maps, Aspect’s weak-soils map allowed the City to easily spot areas where weak soils and vulnerable infrastructure overlapped. Aspect also assisted the City in pursuing remote surface elevation surveying techniques including use of synthetic aperture radar (InSAR), a satellite-based radar distance measuring technique that permits detection of precise changes in ground surface elevation over time. These studies looked at time-series analysis of data beginning well before tunneling started through shaft dewatering and continuing to the time of the study. They showed an unmistakable correlation between rescue shaft dewatering and broad areas of ground settlement. Dewatering the excavation required pumping, but at a rate and depth to keep water pressure low (too high could risk “blowing out” the bottom of the 130-foot-deep shaft). There are two aquifers beneath the rescue shaft site and Pioneer Square area – one shallow and one deep. Because the shaft bottom sat in the “deep” aquifer, pumping targeted that aquifer, which was thought to be confined from the shallow aquifer and the vulnerable utilities sitting above it. However, because settlement happened in the shallow aquifer area, Aspect’s forensic analysis looked at answering several questions: how susceptible are the utilities to pumping a deep aquifer? Does pumping the deep aquifer cause dewatering of the much shallower aquifer? And if so, does pumping the deep aquifer or dewatering the shallow aquifer cause most of the settlement that the City was observing? Understanding the hydrogeologic connections between pumping the two aquifers and the net effects of dewatering on soil behavior required multidisciplinary consideration of many factors. This graph from TRE Altamira shows the elevation of a single point on the map near the area of greatest ground subsidence. The dots show the date of the satellite pass, and the elevation difference from the baseline series. The sharp drop in elevation between October and December 2014 corresponds to the period when shaft dewatering began. These satellite altimetry data correlated well with elevation control data collected by others using traditional on-the-ground surveying methods. To understand the amount of shallow dewatering that had occurred, Aspect developed a comprehensive groundwater monitoring program that instrumented existing wells to collect data while the dewatering pumps were running. Then, once the pumps were shut off, before and after comparisons of water levels could be made to see the changes brought on by dewatering. Data collection continued until dewatering had ceased and groundwater levels had returned to normal. Ultimately, the project team concluded that there had been localized impacts to the shallow aquifer that were related to pumping of the deep aquifer. Some of those impacts were the result of leakage from the shallow aquifer downward along the outside of the Bertha rescue shaft, and some from leakage between the shallow and deep aquifers that occurred along zones of disrupted strata that the Seattle fault created to form the complex geology below Pioneer Square. The data collected by our team provided strong support that the Bertha shaft dewatering caused enough settlement to require replacement of vulnerable utilities. This led to a program in 2015 to replace the large water main buried below Western Avenue, with Aspect providing the geologic analysis used for the design. The drive along Western Avenue is now much smoother, and the section of new water main is now less vulnerable to the next big construction project or major earthquake. 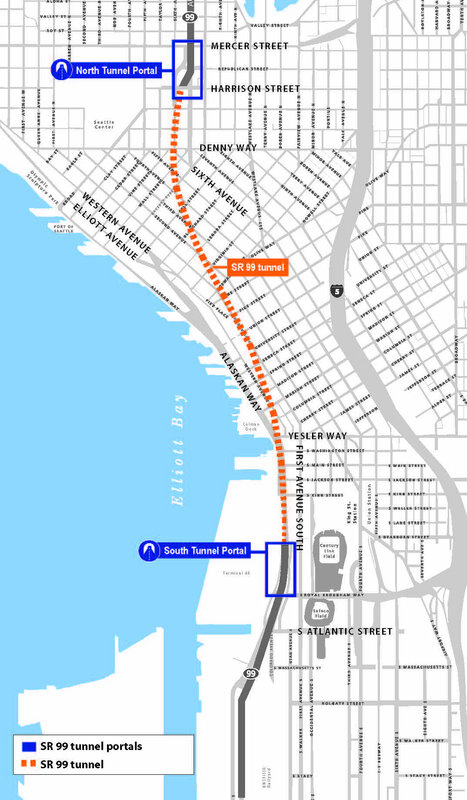 Ironically, while past activity along the Seattle fault was largely responsible for the complex hydrogeology that made dewatering the Bertha rescue shaft a challenge, it was concerns about future rupture of the Seattle fault (or one of the other regional faults) that triggered replacing the Viaduct with the tunnel to begin with. This in turn led to the rebuilding of the waterfront seawall and reconstruction of Pier 62. 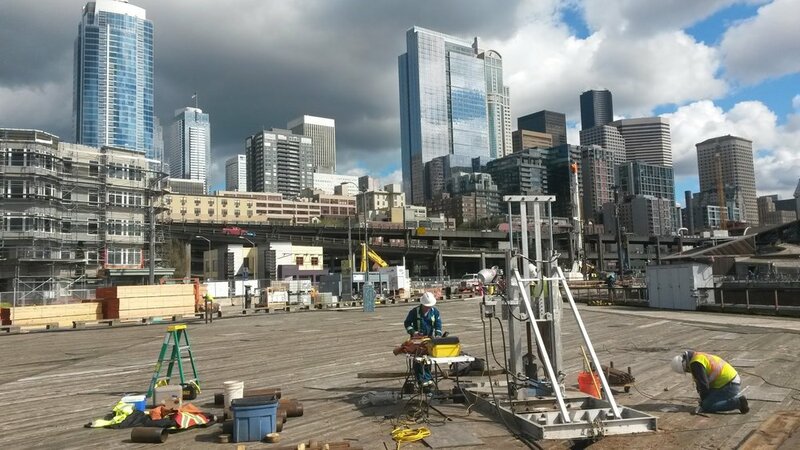 As some Aspect geologists are fond of saying – “geology explains everything.” With a site as complex as the Seattle waterfront, it takes an expert “read” of the geology and a skilled team of geologists, hydrogeologists, and engineers to inform design for projects that make Seattle safer and better for the future. While the water main beneath Western Avenue was being replaced and groundwater monitoring continued, WSDOT crews had Bertha repaired and chugging along beneath the city, breaking into daylight near South Lake Union in April 2017. Seattle now awaits the opening of the tunnel Bertha cleared that will move traffic through the complex web of geology, hydrogeology, infrastructure, and development that makes up the Seattle waterfront. Dewatering is the process of pumping water to keep an excavation dry. Meet Nick Iapalucci and Henry N. Haselton! Technical Support Specialist Nick Iapalucci and Staff Engineer Henry N. Haselton (definitely a relation to his uncle, Aspect’s Principal Geotechnical Engineer Henry Haselton) recently joined Aspect’s Seattle office.Here are five questions we asked to get to know them better. I grew up in Carrollton, Texas and went to college in Santa Fe, New Mexico. My wife and I were ready to expand our careers and our son was starting middle school, so after finding work in Seattle we decided to make the move! What inspired you to pursue Technical Support. What made you curious about it? I have been in a support role in wide variety of fields: outdoor recreation, film, theater, radio, social work, childcare, and information technology. I enjoy helping people and solving problems. What do you like best about your area of expertise? What excites you and keeps you motivated? I think this is a very exciting time to be working with information technology! With our advances in virtualization and connectivity, I think possibilities have expanded farther than we can imagine at this point. I have family in California, Colorado, Texas, Pennsylvania, and Massachusetts so traveling is a popular activity. On the weekends we camp, hike, bike, paddle, or whatever else we can come up with outside. Nowhere permanent! Our dream house will probably be an RV someday. Henry N. Haselton rating the Grand Canyon. Where are you from? If you’re not from the Pacific Northwest, what brought you here? I grew up on the coast of Maine in a small town called Rockport. I spent the last 7 years in Bozeman, Montana, before coming to Washington. I came to the Northwest because I love the combination of the big mountains and the ocean. What inspired you to pursue geotechnical engineering? What made you curious about it? I was initially drawn to civil engineering because of my interest in math and science and a desire to apply these fields to real-world problems. I have always enjoyed problem solving, so civil engineering made sense as a field to pursue. Within civil engineering, I was attracted to geotechnical engineering because of the highly variable nature of soil and rock between different locations. I have always been drawn to the outdoors, so working in an engineering field that involves site-specific field investigations and learning about varying ground conditions is a great fit for me. I like that geotechnical engineering requires lots of field work and site investigations to determine the specific conditions in a given area. I enjoy learning about the natural world surrounding us and how to allow humans to inhabit places safely and sustainably. The spatially variable soil conditions and hands-on investigation keep me motivated and interested. I am excited to learn more about the geology of the Pacific Northwest and be able to apply it to geotechnical engineering. I enjoy a wide variety of outdoor recreation, including skiing, mountain biking, hiking, backpacking, and fishing. I am trying to spend more time learning some water sports such as white water rafting and surfing. I am excited to live in the Pacific Northwest so I can explore new areas for skiing and other activities. There are lots of new places I would like to visit and many I want to revisit as well. Near the top of my list for new places to travel would be doing a ski trip to Chile and Argentina in our summer (winter in the southern hemisphere). Over the past five years, we’ve seen the Bellingham Waterfront District transform from a contaminated industrial site to a striking new waterfront park. We’re proud to have had a hand in cleaning up the site and providing geotechnical and environmental consultation throughout the design, permitting, and construction of the project. This included providing geotechnical design recommendations for siting of the 400,000-pound industrial acid ball tank turned public art piece titled “Waypoint”. Congratulations to the City of Bellingham on your beautiful park! Read more about the history of the park, the status of the waterway, and what’s next for the adjacent properties in this great Bellingham Herald article. As the Washington Boulevard landslide continues to move, it threatens to cut numerous Kingston residents off from the town and emergency responders. Since a significant slide in 2006, Aspect has provided geotechnical services at Washington Boulevard, including gathering data and monitoring and studying movement along the slope. Recently, Kitsap County Public Works decided to implement a slope dewatering system to remove groundwater from the landslide mass and increase the stability of the hillside and roadway. Aspect’s Andy Holmson provides some insight to the solution in this Kitsap Daily News article. That’s some nice looking beach gravel! Aspect has been helping with geotechnical engineering and construction monitoring for the City of Bellingham’s Waypoint Park project. When finished later this year, it will mark a new era for Bellingham’s waterfront. 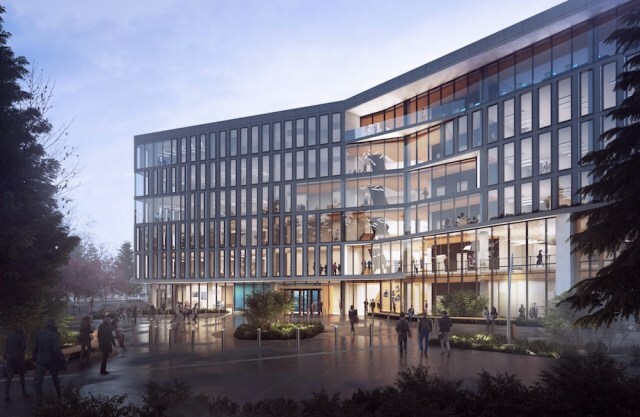 See the Bellingham Herald’s video below for a glimpse of the construction underway. November is historically the wettest month of the year in western Washington. The seemingly constant mist of precipitation punctuated by storms that dump inches of rain in short amounts of time sends water levels in area rivers rising. The risk of flooding presents a critical need to protect nearby homes, businesses, and habitat. Levees a play a key role in that protection. In the old days of flood control, a levee was typically little more than a pile of dirt. These days, they’re still dirt, but have evolved into a highly engineered, specifically designed mass, often made from less permeable soil (like clay) and designed wider at the base and narrower at the top. Levees are especially critical in floodplain areas to maintain healthy fish and riparian habitats, and of course near neighborhoods and businesses that would be vulnerable should a river top its banks. Lead geotechnical engineer and hydrogeologic support for Lower Russell Road Levee Setback, which is improving 1.4 miles of the flood control system along the Green River in Kent. Once completed, the project will provide greater flood protection and water conveyance capacity while improving both riparian habitat and recreational opportunities. This project is nearing the 60 percent design stage of completion, and is anticipated to be constructed by 2020. More project information and pictures can be found on King County’s project page. Geotechnical engineering and hydrogeologic efforts for the South Unit Shillapoo and Buckmire Slough Restoration Design, along the Columbia River in Vancouver, Washington. The project will improve hydrologic access to approximately 540 acres of intertidal, freshwater slough and wetland habitat. Our work first includes subsurface explorations and geotechnical design for breaching the existing levee (to clear room for the new levee); constructing three WSDOT bridges along State Route 501; flood control levee construction; roadway raises to meet 100-year flood elevations; and construction of up to 14 interior water control structures in the wetland system. You can read more about the project on the Washington Department of Fish & Wildlife’s website. In late November, Aspect will provide both geotechnical and environmental services on the Pacific Right levee setback, along the opposite site of the White River from the Countyline Levee. The project will create a setback levee between the BNSF Railway and Government Canal to significantly reduce the potential for river flooding of adjacent neighborhoods. Learn more about the project on King County’s project website. 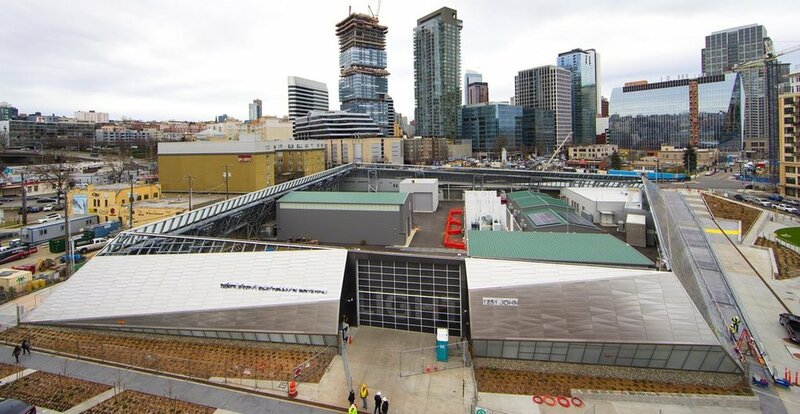 Seattle’s Daily Journal of Commerce reported yesterday that construction on the city’s new Pier 62 will begin in two weeks. Once completed, this $34.8 million dollar rebuild will create a new park on the pier and reintroduce the public to this part of Elliott Bay. Aspect helped set the foundations for this new phase of the Pier 62’s history. Read more about the construction on the Daily Journal of Commerce’s website and Aspect’s previous work on our blog. Worldwide Great Shakeout: Are You Earthquake Prepared? Stocked up? Emergency plan written and communicated? Even if you feel behind, just starting the process is a great first step. Today is the Great Shakeout in the Pacific Northwest and worldwide. In the Wenatchee Valley, it’s a common source of pride that Washington is the top producer of apples and pears in the nation. But with so much fruit coming off the trees at roughly the same time each year, have you ever wondered how crisp, crunchy apples and pears are available in the grocery store year-round? Or what enables people across the country—and around the globe—to recognize Washington as the source of the world’s best tree fruit varieties? Enter the technology of controlled atmosphere (CA) storage. The Wenatchee Valley – the nation’s top apple and pear producer – keeps grocery aisles around the world stocked year-round by using massive, specially constructed warehouses designed to slow the ripening process. A quick background on tree fruit: as apples and pears ripen, they take in oxygen and release carbon dioxide. Years ago, researchers determined that by limiting oxygen, introducing a little nitrogen, and lowering the temperature, the ripening process can be slowed. To apply this concept at a scale large enough to support Washington’s apple and pear industries, packers build enormous warehouses capable of holding multiple-orchards-worth of fruit within special airtight, refrigerated rooms. This gives shippers the flexibility to releasing fruit incrementally throughout the year, and allows you and I to enjoy a crunchy Honeycrisp apple in the middle of February, months after it was picked. Building a CA-storage warehouse involves three special considerations: they must be massive, they must be stable, and they must be built quickly. Once fruit is off the trees, it gets hauled in bins that can weigh upwards of 900 pounds when full. Moving these bins requires big equipment (like forklifts and semi-trucks) and efficient storage requires stacking them up to 12 high—that’s a lot of weight! To maintain precise control of the atmosphere within these buildings, the rooms must remain airtight. This means that the foundation and walls must not shift, settle, or crack. Finally, market demands for additional storage capacity often drives the need for new CA warehouses to be built on short notice, with expedited timelines. One full fruit bin can weigh 900 pounds. Stack those bins 12 feet high, and the need to engineer stable foundations for the warehouses that hold these bins becomes critical. To meet these rigorous requirements, CA-storage warehouses are typically constructed out of giant precast concrete walls supported by cast-in-place concrete foundations capable of supporting substantial floor loads—up to 1,000 pounds per square foot. Designing for this type of stability requires the expertise of a geotechnical engineer for understanding how soils beneath the building will behave when loaded. By studying the local geology, excavating test pits, and drilling cores, geotechnical engineers can specify how wide and stout the footings and floor slabs should be at a given site. Aspect geotechnical engineers Nick Szot and Erik Andersen have guided the design of several CA-storage warehouse projects for industry leaders like Blue Bird, Gebbers Farms, McDougall and Sons, and Peshastin Hi-Up. Aspect is proud to be the tree-fruit industry’s local, responsive firm for geotechnical services in the Wenatchee Valley and central Washington, and for our role in bringing Northwest pride to homes across America and around the world. The Puget Sound area has been deluged with rain over the last few days, all within an already almost-record-breaking month of precipitation. With increased rain comes increased risk for landslides, and Aspect staff have responded to multiple ones over the last few days. 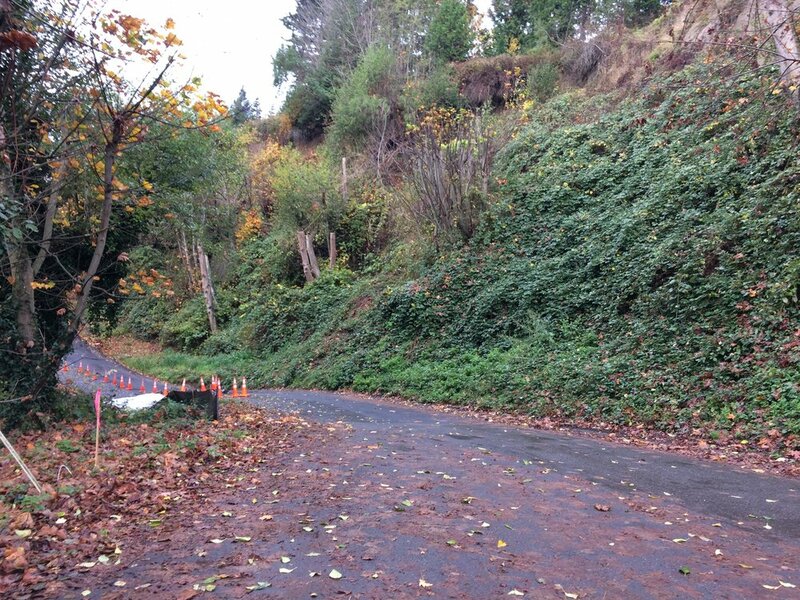 This MyNorthwest article gives an explanation of landslide risks in our region with tips how to spot warning signs. Aspect is excited to welcome Na Hyung Choi and Allan Covell! Staff Geologist Na Hyung recently completed her MS in Geology at Oregon State University. Her graduate work focused on geomorphology and structural geology of faulted alluvial fan complexes through field assessments, remote sensing, and numerical modeling. She joins Aspect's Bainbridge office, where she has been busy with steep slope reconnaissance and subsurface investigations for our geotechnical group. Alan joins Aspect's Yakima office as an engineering designer. Allan brings over 15 years of experience as an engineering drafter/designer and will be engaged in water resources, geotechnical, and environmental projects at Aspect. Here are five questions we asked to get to know them better. 1. Where are you from? If you’re not from the Pacific Northwest, what brought you here? I was born in Seoul, South Korea, and spent my childhood there, but I did most of my schooling in Georgia (the state). Then I moved to Corvallis, Oregon, for graduate school and lived there for 3 years before moving to Washington to join Aspect. I am a little bit surprised how things turned out. I remember from middle school the disdain I felt toward my younger brother’s mineral collection because it seemed so nerdy! But gradually I became aware of my appreciation for the outdoors and my enjoyment for learning why things look and act like they do. When I learned that a geology degree at the University of Georgia required a 6-week field course in Colorado, I was sold. Also, being in the South, I liked how I could delve into topics like evolution, climate change, and resource exploration that many found/find controversial. I like being able to picture the processes that formed a landscape when I look around, and I can’t imagine exploring the world any other way now. At work, I enjoy applying my geological background to urgent questions by putting my foot on the ground and probing what’s around and underneath. I like seeing concrete reasons and results of my work, and it’s exciting to be able to say, “Hey, I helped build that!” or “Hey, I helped make this house a safer place to live!” I thrive when I’m constantly learning new things, and I’m very happy to be doing just that every day at Aspect. I love to cook. I read cookbooks for fun, watch a lot of cooking videos, and sometimes fantasize about taking a week off just to try a bunch of recipes. I love being in the mountains and try to go hiking every weekend. I also enjoy trying to rock climb, playing violin, visiting the local animal shelter to pet cats (and dogs), and goofing off with my partner, Phillip. 5. Where in the world would you like to travel next? I’ve been wanting to visit Japan for a long time, largely for their food. I’m born and raised in the Yakima Valley, currently living in Selah. I’ve lived in the Tri-Cities, Ellensburg, Spokane, and Puyallup, but have always felt more at home in Yakima area. I like being near the mountains and sagebrush, surrounded by all the orchards, vineyards, and hops. It makes all the seasons very distinct and beautiful. 2. What inspired you to pursue Engineering? What made you curious about it? My father is a Civil Engineer, so I was exposed to his type of work from an early age. He would take me to his office and various construction projects that he was working on. I was curious about it because I like to know how things were designed and built. I especially liked looking at drawings and maps. I’ve always liked drawing, and CAD software means I can do it faster and better than I used to by hand way back in high school and at my first job. Since Autodesk has been improving Civil3D, drawing cool things in 3D has gotten a lot easier and more accurate. I’m excited to see where this software is headed over the next few years. I enjoy spending time with my family, especially watching my kids learn and play sports. I also do some running (road and trail) when I have time and play coed volleyball on a city league team. I’d love to go back to Cancun, Mexico for a second honeymoon. It’s been over 15 years since I was there and I’d like to see if my memory matches reality. Plus, I’d love to bring my kids along so they can experience a foreign country (Canada doesn’t count), some high humidity heat, and gorgeous white sand beaches. Writing for the Daily Journal of Commerce, Aspect's Andrew Holmson covers why it pays to know your geotechnical engineer during habitat restoration work. Aspect’s Andrew Holmson will be presenting at the American Public Works Association’s (APWA) fall conference in Spokane on Thursday, October 6. He and City of Port Angeles Engineering Manager Kathryn Neal will present Protect and Innovate: Port Angeles Landfill Stabilization – the story of how the City and a large, multidisciplinary team relocated 400,000 cubic yards of refuse away from a 140-foot bluff overlooking the Strait of Juan de Fuca while building Washington’s tallest reinforced soil slope. Aspect has provided geotechnical engineering, hydrogeology, and environmental support to the City’s closed landfill facility since 2007. We led the engineering geology team in determining long-term and short-term shoreline and bluff retreat rates, evaluating options for removal of existing shoreline protection structures, extending or modifying the structures, evaluating bluff slope failure mechanisms and slope stabilization options, landfill cell relocation, and fill slope stabilization and design. Work on the slope was completed ealier this year. Aspect continues to support the City with operation and maintenance of the landfill gas system and have provided environmental monitoring and support to meet regulatory reporting requirements. Learn more about the APWA’s fall conference here and read more on Aspect’s efforts on the landfill here.